Shopping for a fuel efficient car will get easier starting with the 2013 model year. The U.S. Department of Transportation and the U.S. Environmental Protection Agency unveiled new fuel economy labels that are designed to help consumers take advantage of increased fuel efficient cars. The new labels will include estimated annual fuel costs and the vehicle's environmental impact. Because more vehicles are designed with alternative fuel sources, such as plug-in hybrids and electric vehicles, the new labels will make it easier to compare different models. They also will include information on the driving range and charging time of electric vehicles. 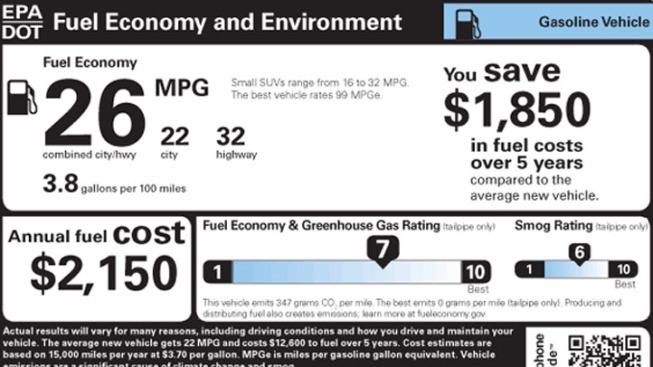 If you want to see what the new fuel economy labels, click here.